I Can't Make It To The Event! Camping reservations are non-refundable. You are welcome to offer the site to another camper and/or sell it at your discretion if you are unable to attend. We do not mail swag purchases to people. You can have a friend pick up your order if they have a copy of your Paypal receipt with them. Otherwise, by 2pm on Saturday all unclaimed items at the store become available to anyone for purchase. After the event we tally who did not pick up their swag and issue refunds (minus Paypal fees). Pricing is for the full event period, Thursday 10am until Sunday 12pm. No discounts for partial use. Sites are 24' wide by 30' deep. 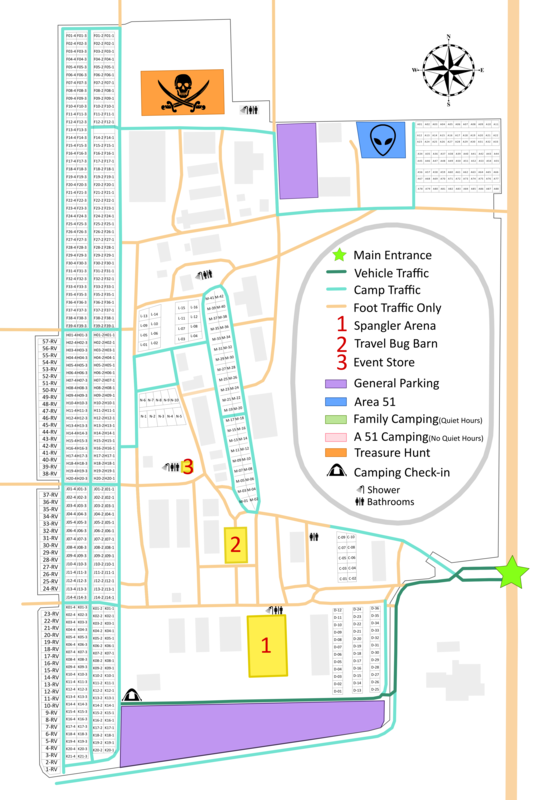 Campsite information has been compiled by volunteers, if your reserved site does not match the data provided - we will do everything we can to accommodate you in an alternate location. Is there any cost to attend MWGB? No, there is no registration fee to attend MWGB. You may attend for free. The only "costs" to attend are your travel costs, food, lodging, souvenirs, flat tire repairs, tow truck bills when you get stuck on that back road you were just sure your mini-van could get down... that kind of thing. No, but it's super helpful to us. It takes only a few minutes and really does provide us a lot of value. Registration is closed. Can I still come? Absolutely! Just show up! You will still want to read the schedule, event page, etc. to be sure you know where to go. Camping reservations are closed. Can I still camp? Absolutely! Just show up! We have tons of camping space. At the door camping is first come, first served for site selection and is $15 more than booking online. Should I Buy Things Now for Will Call Pickup? Yes, we strongly suggest this. It saves you money (usually 10%) and more importantly guarantees that the stuff you want will be there. We do not order a lot of additional items, usually 10-20% over what is ordered in will-call. Most items will be sold out by Friday evening at the event. If you order will call items, remember to pick them up before 2pm on Saturday. After that, all unclaimed will call orders go into the main store for sale and you may lose your items. It's a big venue - what will make my life easier? If you have a bicycle - bring it. Kids will enjoy riding around the grounds and you will get around a lot faster. Motorized vehicles should be used only for in and out travel (leaving the grounds) not for intra-venue travel. I've never been to a MEGA event before! What should I expect?